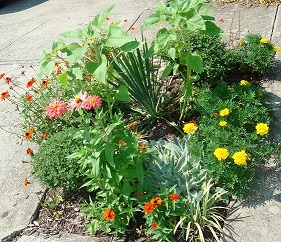 The picture below shows a small section of my front yard landscaping as it is now. There have been lots of changes over the past several years. 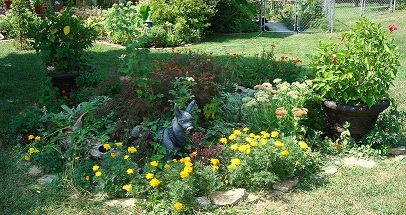 The mums and sedum are not in bloom yet but when they are will be very colorful. Keep reading and looking at the photos below for details. The picture above shows a small section of my front yard landscaping as it is now. There have been lots of changes over the past 4 years. The photo below shows the same area of the front yard in autumn. 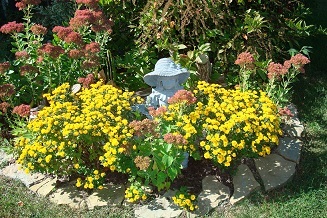 The mums are blooming and the sedum is now in full display of color. Shop at Brecks.com for $25 off your order of $50 or more! Click on the link below to save money of bulbs for your flower gardens in your front yard landscaping. If you recently moved into your new house and it already had existing front yard landscaping chances are - that you are not "just crazy over" every detail of the existing landscaping. The exception to this would be if you loved the curb appeal so much, that the beautiful front yard landscaping was the reason you "just had to have the house"! Or you got to choose all of the landscaping plants and did the design before your moved in. If either of these above mentioned exceptions are true, you probably won't visit this page of this site often, until you grow tired of something about your new home. But wait, before you go- Bookmark us, because you WILL want to make changes eventually, if not on the front lawn, somewhere else around the house. Or better yet hang around for a while. You may just get some inspiration for another home decorating project. Dig deeper we have lots of ideas for other improvements both inside and outside your new home. The photo below shows one of my new flower gardens I made this year. It also shows the flowers around my mailbox. Personally I NOW enjoy my back yard and front yard landscaping more than my house, during the warm months, but that was not the case when I moved here. Our home has been in a constant state of improvement since the cold December day I moved in. My husband had already started many home and garden projects here before I knew him, but together we have constantly made lots of updates both inside and outside of the house. Home and Garden Improvements are what we do. We both love our home, therefore we want to make it the way we want it, so we enjoy improving it and personalizing it. And with that being said, this site www.improve-your-home-and-garden.com was born. This site is our Baby! Please bare with us as we show off some of our favorite pictures through out the site. You will also get to see pics of our other loves- our 2 dogs and 2 cats (update - and 2 kittens) that we live with and work with daily. Ahh the joys of working from home with the ones you love! Update I now have twins- my husband surprised me with a pair of gorgeous gray long haired kittens recently and I am working with them asleep on me as I type this. So now we have 4 cats and 2 dogs. Find out more about me and why I love working from home on my web business so much at the link below. I love the freedom that comes with being self employed. Read more about me and my reasons why here. Let's get back on the topic at hand- YOUR front yard landscaping needs. Consider removing or replacing some or all of your outdated front yard landscaping for added curb appeal if you have any of the following problems. Relax, you don't have to do it all at once. Take your time, enjoy the progress and think thru your ideas as you proceed. If your home is difficult to see from the street because the trees and bushes are overgrown, it is time for some changes. Unless you really want all of that privacy from the outside world? First from the street angle - can you clearly see the front door of your home? Are you able to see the house numbers? Is the shrubbery taller than the porch rails? Are the evergreens shaped like squares or balls that are oversized for the size of the house? Do you have plants, trees or bushes that are dead, or you wish they were! Or maybe they are straggly because they are on their last legs? Or is the style of the front yard landscaping simply unappealing to you? You did not plant it, never would have planted it and don't like the look of it. Enough said about that! All of the above issues are good reason to rethink your front yard landscaping. Next go inside your home. Look outside your front facing windows from the inside of the house. What do you see? Can you see the street clearly? Or are you seeing an oversized tree that completely blocks your view outside. Or maybe you can't see clearly because of overgrown shrubs that are planted close to the windows and blocking the front view. 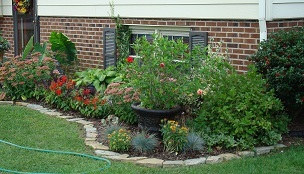 Your front yard landscaping should be visually appealing from both the street and the inside of your home. Unless you want the privacy and like the look of an unkept front lawn, keep reading. Does the mailman spook you because you cannot see his arrival? I bet you are getting the idea of what I am referring to by now. Let's clean it up and make your front yard landscaping beautiful. Buyer approved! Shop the best-selling adirondack chairs in the world! I just returned from taking a short break from writing this webpage. While on my break I went out side to my front yard landscaping to water some plants. A nice man visiting a neighbor across the street stopped to tell me how nice my front yard landscaping look. I was just watering one of my gardens. The picture above shows the garden I was watering. I call this my FREE Garden, read on to find out why. That is a great feeling, the sense of pride is wonderful when strangers stop long enough to let you know they noticed your lawn. Each year I do something a little different to the front yard landscape. I achieve a new look by adding colorful flowers or moving some of my garden decor around to get a new look. Of course as everything grows and matures I divide plants to add to new areas we develop. I will give details on how to add to your garden FREE. It is so much fun to SHOP for plants from your own landscape. Follow these guidelines and you will have that sense of pride too. IT goes without saying that no lawn looks good if the grass is not mowed regularly. Trim weeds as needed too for the best look. If the plants and shrubs are outdated, take a closer look, if there is alot of dead branches inside shrubs and they are alot of upkeep to keep them trimmed consider removing them. This can be a big job. You will have stumps and roots to deal with. Consider renting the proper equipment if you determine that the roots and stumps need to be removed. 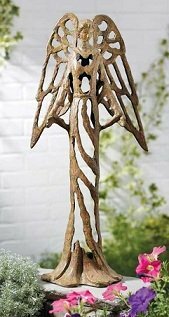 They will eventually rot away if you leave them, but will effect any digging you do to replace plants. 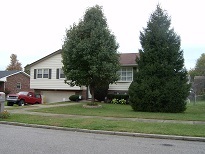 The picture above shows the way the front yard landscaping looked when I moved here almost 4 years ago. The shrubs were neatly trimmed but out of scale for the house. My husband lived at this residence for several years before we got together. He had painstakingly kept all of the evergreen bushes trimmed all the time before I moved here. . Since the evergreens were here when he bought the house he maintained them. The front yard landscaping was well kept, but very dated. It was in need of an update. I persuaded him that it would make everything look nicer and feel bigger if the outdated evergreens were removed. By this time I had been here a few months. We had worked on several indoor projects together and he had learned to - just trust me! The other plants that he had planted with the evergreens were fine. Reluctantly, he removed the large shrub next to the front door first. This shrub was huge - perfectly shaped like a hot air balloon. YUK! The new open feeling without the shrub was great! Wow, now you could enter the house without rubbing a shrub! I did not know there was a wall lantern beside the door! Notice the picture above again, your cannot even see the front door from this angle. As you can imagine, when he got to see how much of a difference removing one shrub made, he had all of the shrubs out within a week. He used a small digger with a backhoe attachment to remove all stumps and roots. The evergreens were all dead on the backside and inside. The only thing left that was green was a few inches on the outside. The change was very dramatic. We both loved the new look. (I knew we would, I have had large shrubs removed at other homes before - and the result is always an improvement). Removing the shrubs left us with lots of room for new plants. That was the beginning of a totally new front yard landscape. Later that spring we removed sod on either side of the walkway and created a beautiful new landscape. I recommend really taking your time to plan your new landscape. This way you can get the look you desire. An example is - If you have a straight walk, add curves to soften the effect. If not, alot of straight lines is like looking at a runway. We added additional curves as we changed the landscaping. We have alot of concrete, a straight walkway and a sloping driveway. Way to much concrete without landscaping to soften the look. That is not a good look for you front yard landscape. Grass alone will not be enough to make the looking appealing from the street. It looks to commercial for a residence. 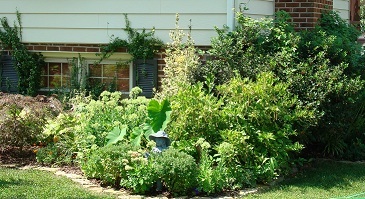 Use a good mix of plants and shrubs of varied heights and colors so you will have something green in the winter months. We left 2 holly bushes on the end of the house, only after he agreed that he would no longer shape them. See the Picture of our front yard landscape above, taken 2 years later. The picture at the top of this page shows the way the corner looks now. Our front yard landscaping changes from year to year as plants grow, we rearrange and divide perennials and plant annuals. I change the arrangement of my landscaping from time to time to meet our needs. We do alot of landscaping projects at our home. I sometimes refer to my garden as the mobile garden! I know most people don't have this many changes, but someday we will just maintain what we have instead of adding each year. Those holly's on the end are the only original bushes. They were trimmed into squares. I hate landscaping trimmed into balls and squares, because it is so formal. Formal landscaping is beautiful if that is the look you want, but it is simply not the look we want. We are not formal people, so it is not a good fit for our style. The holly bushes are now unshaped, it took a while, but I now love the look of the holly's. They blend perfectly with all of the other plants we added. I prefer a more natural look for all of my landscaping. Of course you cannot let every plant go without trimming, but you don't have to make formal shapes out of the plants. The look is a personal choice. So go with the look you want. That was 3 years ago. I have taken alot of pictures of the changes in the yard over the time and when I reflect back it is amazing. The first year everything was so new looking and clean, I filled in with lots of annuals. I have since starting dividing perennials and everything is all filled in. 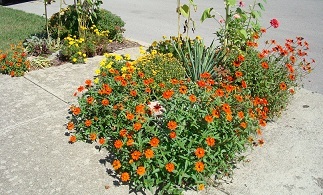 I still add lots of annuals that I grow from seed saved from the previous year. A favorite is marigolds in mixed colors of orange and yellow. They look great with the orange front door. I promised my husband that the neighbors would like the new look. We get compliments alot and since we updated 3 other houses on our street have removed the old shrubs from their front lawns and changed their landscaping. The Picture below shows a new garden we made this year. This was just a small retangular area of grass out next to the street. It was surrounded by concrete walkways and driveway. I removed the sod and divided perennials and added annual flower seed to make this new colorful front garden space in my front yard landscaping. It is now one of my favorite flower gardens. If you have large trees in your front yard they can be a great source of shade. Or they can take up way to much space, depending on the size of your yard and type of tree you have. If you have a shade tree, keep the lower branches trimmed off so that you can walk under the tree comfortably. You can also plant shade loving plants under the tree. But if you have a large pine tree that goes all the way to the ground they can take up alot of space. Oversized trees can totally block the view of the house from the street. They also can block out the street view from the house. An established lawn is beautiful. And we all plant things when they are small. Sometimes trees can be added over the years that can start to make everything a bit to close together. When that happens you CAN make adjustments. There was a huge pine in our front yard. (see picture left) We don't know how old the tree was. There was also a bradford pear tree in the front yard. During the warm months when the bradford pear was leaved out the house was difficult to see.The pine was also hiding alot of our new front yard landscaping. We live in a subdivision, so lawn frontage is not oversized. I am sure that the pine tree was planted many years ago. The pear tree may have replaced another tree or possibly have been planted several years after the pine tree. My point here is, the front yard is not that large, and the pine tree was huge. It was also gorgeous, so removing it was a difficult decision. We tossed the idea around for a few years and finally decided the beautiful pine tree needed to go. Everything happens for a reason - One day our neighbor was getting some trees trimmed by professional tree trimmers. I saw this as an opportunity to get the tree removed and save money because they were already in the neighborhood. I approached the tree trimmers and asked for a cost to remove our big pine tree. You have to keep in mind here that my husband and I are do it yourself types, and hiring professionals is not something we like to do! You are probably reading this website because you are the same way! Long story short- The price was not so bad, and they would haul it away. Hiring the professionals meant that my husband would not have to touch it, that would save him alot of work. The mess would be gone that afternoon and I could start another garden in the place the tree had been. We decided to go with it. The change was outstanding. It opened up the yard and we could see out the front bow window! Yeah! I know I am making it sound like a big deal, but the results were fantastic. If that tree was still in our yard it would be touching the pear tree now. That project was 2 years ago. I don't miss the tree when I get to walk outside and see all of the changes we have made in its place. Note- If the tree had been in a proper location in our backyard It would have never have been removed. Unfortunately it had grown to be way to big for the front lawn. We did not remove the roots, they cut the stump of at the ground level. It has not presented any problems with new plantings. Now the front yard landscaping is all in a much better scale for the size of the yard. the overall result is much more appealing.